You can tell I've been back at work, because I haven't written a word in a week. Well, that's not true. I've written news scripts and e-mails. But every time I go to work, the blog dies a little. Anyway. We received the news about my dad not long after I wrote that post at the Starbucks last Saturday. He has irreversible lung disease. The scarring that has already happened won't heal, but they can treat him to slow it down and the goal is to get him home. He's made awesome progress in the last week. He graduated to a regular oxygen cannula. Yesterday when I visited him, he sat up in a chair beside the bed for more than an hour, soaking up the sunshine. My brother will be home Monday. I know my dad is looking forward to seeing him, and has worked hard to get stronger for Chris. This roller coaster is intense. I'm glad for every moment we have left together. No matter how long that is. 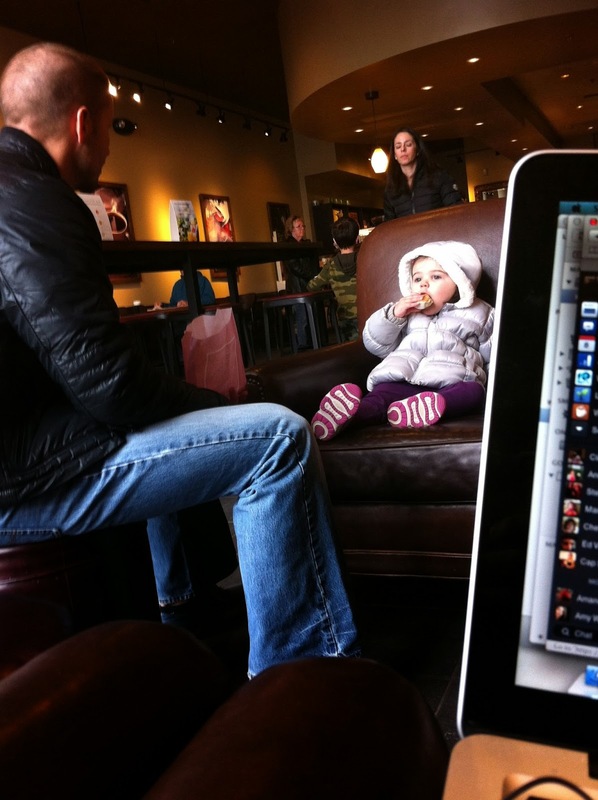 Last week, when I was crying and writing at the Starbucks, I saw this little girl and her dad. I wanted to grab her little hands, hold them tight - and tell her to stay as close to her dad as she can. Love him, lean in to him, learn from him, and be friends.